Amtrak Empire Service: Rochester to New York! Ain't you guys going to New York? Its just 300 miles from here! This was the starting point. The spark had already lit the fire, and more people came in and fueled the fire. With the fire raging, I got searching for ways to go to New York City. NYC was only 330 miles away from Rochester, where I was put up. The prospects of seeing the Statue of Liberty, nothing else, stood out. It took some time for me and my colleague to get to the decision of traveling to New York. Next problem was to find a suitable day to travel - most of our weekends were already scheduled. We finally found one weekend that we could take out. The next issue was booking our tickets. Flights were ruled out since they were really expensive for the short trip we had to do. "What about taking the train? ", was the next question. "Trains here are very slow. There aren't many trains either," came an answer. Okay. But there should be a way. 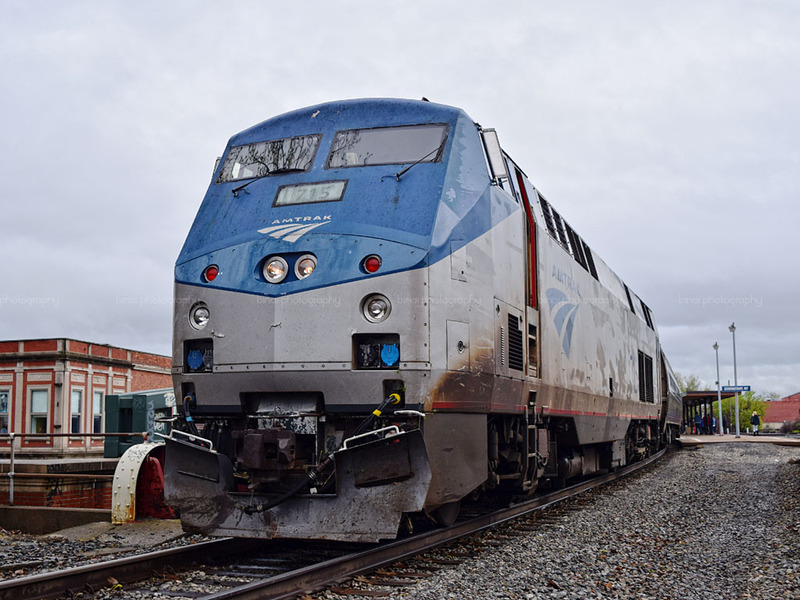 I head to the Amtrak website looking for trains to New York. They listed around 5 of them - none of them were overnight trains. Okay - so what about taking them to return from New York. The same situation repeats - all train ran over the day. We break our heads for a while deciding how to go about. Meanwhile, I look at options to stay and book a bare basic room, to take care of the night we would have to spend in New York. We finally decide to take a train to New York, and return by bus. A slice of both the experiences. 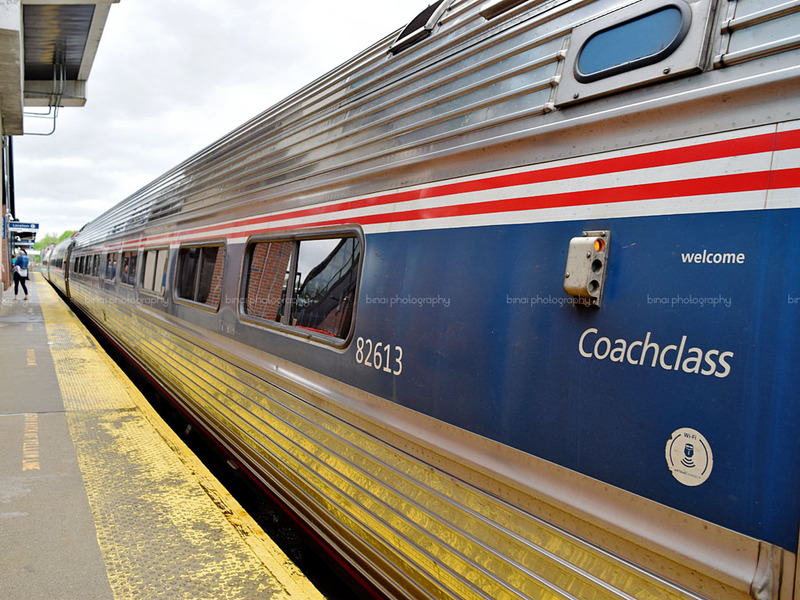 After booking the bus for our return from New York, we head to the Amtrak website to book our ticket. I was a little inclined to book it at the station, but then had no idea how to. For some reason, the website didn't accept our cards and we were left with no option, but to book at the railway station. I message my host about our situation, and he replies in no time that he'd take us to the railway station the next morning, and we could book our tickets from there. The makeshift station office at Rochester.. Platform side of the station. We find ourselves at a large parking yard, next to an under-construction railway station building. We had a hard time figuring out where the booking office was. We finally find a makeshift office, which seemed closed. A cab driver nearby directs us to that makeshift office, and confirms that the booking office was inside. 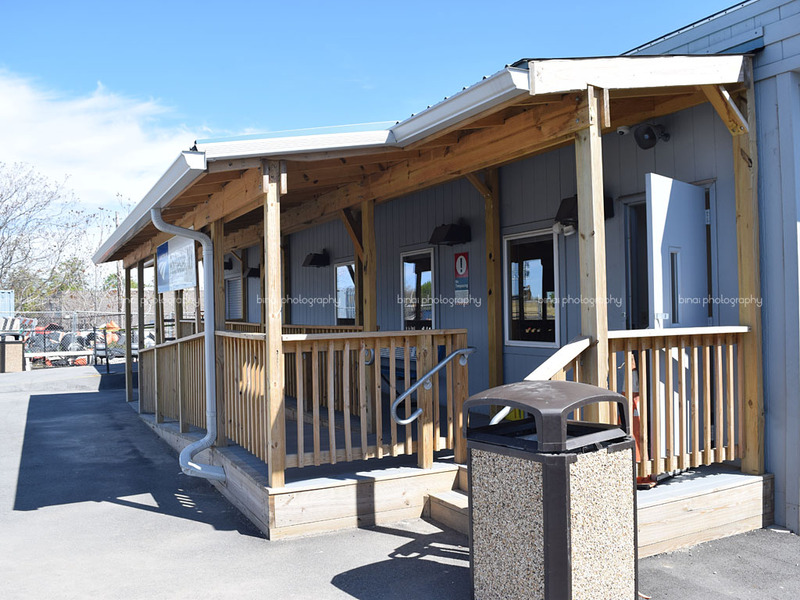 We open a door and walk in, to find a fairly big waiting area, a few machines to dispense drinks and snacks, a self-ticketing kiosk, and a booking office! The gentleman at the booking counter appeared excited as he saw two people coming in to book tickets! After I tell him my destination, and the date I am looking for, he asks if I have a particular choice - I ask him for the first train of the day. He confirms my choice and books our tickets. 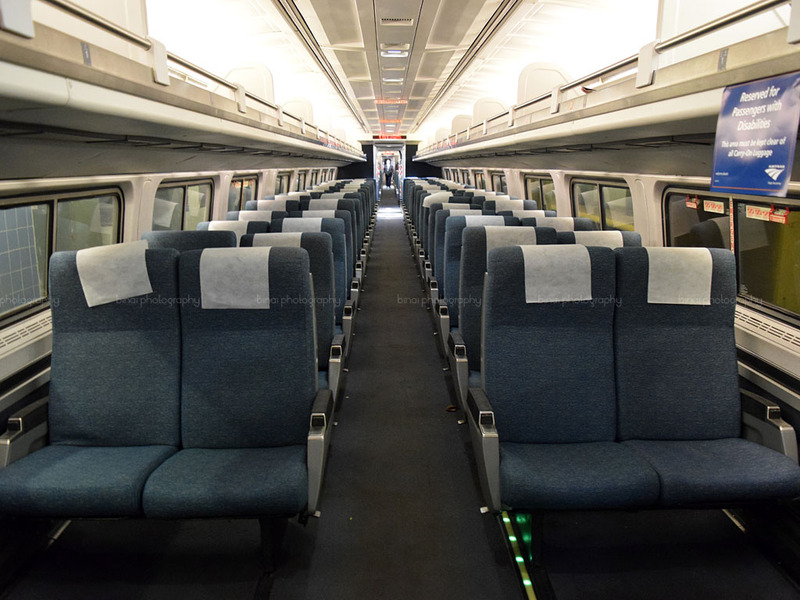 Two tickets for reserved coach class pops out. We had to sign a receipt before he hands us the tickets. 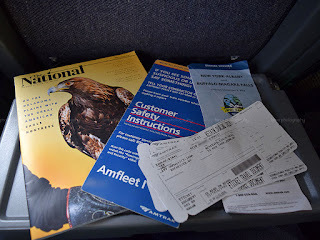 Along with the ticket, which looked like an airline boarding pass, he also hands over a timetable of the entire route. That was neat! My colleague and I leave our residence a little past 0440hrs along with our host at the wheels of the car. The Amtrak station was a little over 6 miles from our place. We get to the station by around 0455hrs - and we had well over 20 minutes to go for the train. It was really cold outside, and we literally rushed to the waiting room in the makeshift railway station building, to experience some warmth. A few passengers were waiting for the train in the waiting hall. A display kept inside the ticket counter informed that our train would be two minutes late, and would now depart at 0518hrs. The waiting area had a few dispensing machines - beverages and snacks, mainly, along with a self-ticketing kiosk. The ticketing counter. Waiting for boarding to be called..
Railway staff became active a little past 0510hrs - I sensed that the train was nearby. 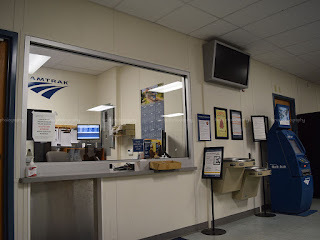 A little past 0515hrs, the railway staff called out for passengers traveling by #280 to New York - and as he opened the door of the waiting room, I could hear the locomotive going past. The train had indeed arrived (0516hrs). 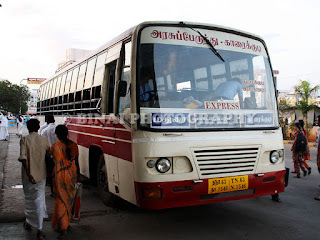 The makeshift platform was short in length - could accommodate hardly 2 coaches. 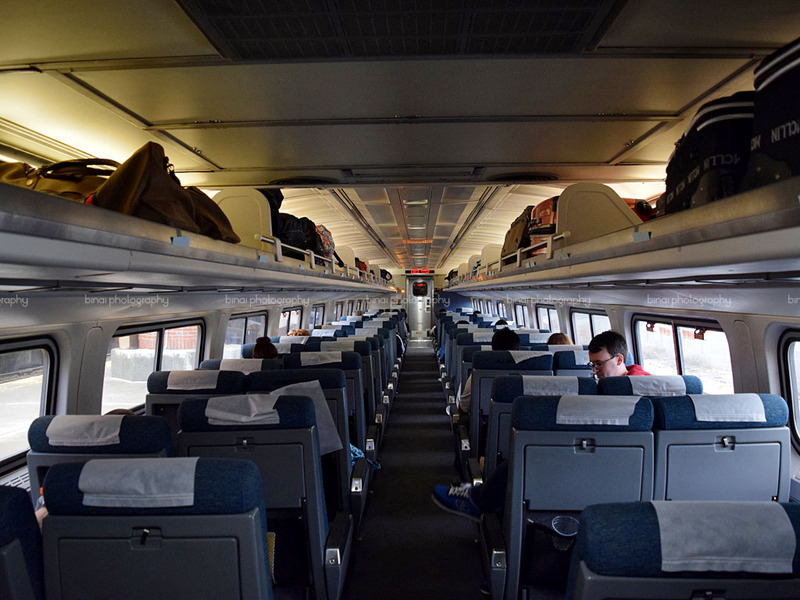 All passengers to New York were directed to board the "forward" coach (third in the formation of 5 coaches) and the other the one behind. All passengers to destinations other than New York boarded the coach behind. 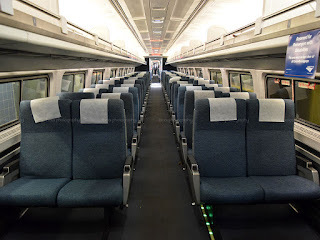 Passengers with business class tickets were also asked to board the rear coach (since the business class coach was the last, and it was outside the platform). I was quite excited as I queued up to board, for my first ever ride on Amtrak. A proper stairway was opened for boarding - it was wide enough, and boarding was easy. The coach was dim lit - just the night lamps were on. Since no seat number is allotted, we just walked forward till we found a vacant row. We took seats on the left side of the coach. We started moving by 0518hrs - there was no jerk as we got moving. The coach was absolutely silent as well. We left our bags on the overhead rack and settled in our cosy seat. The first impression was - great leg room and wide seat. Plug fpoints for the mobile charger was placed at a very comfortable location. A little after we got moving, the conductor came around to check our tickets. He carried a handheld device to scan the barcodes on the ticket and mark our attendance. He also placed two blue cards on the overhead rack to signal that our seat was checked. I switched on WiFi on my phone, and it connected to AmtrakConnect, the free WiFi service without any hitches. I hadn't slept much the previous night, and I badly wanted to sleep for a while. I struggled a bit with the seat push-back button, but - managed to recline my seat a bit. The silence helped me sleep very quickly. However, the vibrations were on the higher side. 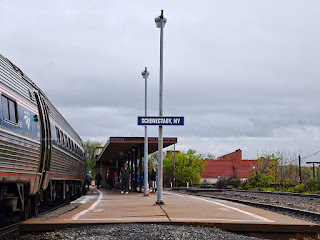 I vaguely remember seeing Syracuse station (0632hrs). I kept drifting between sleep and wake for most of the time. We stopped at Rome (0719hrs) and Amsterdam (0835hrs) during this phase. I was quite excited to see places named after major cities in Europe. 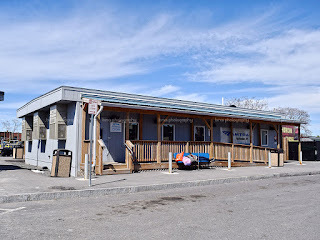 Interestingly, there exists a Greece in Rochester as well! 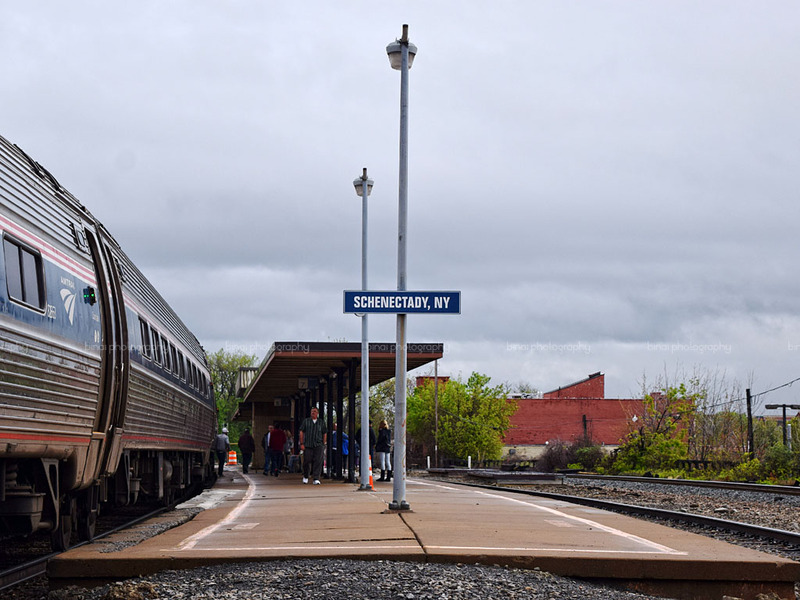 We pulled into Schenectady station at 0853hrs. 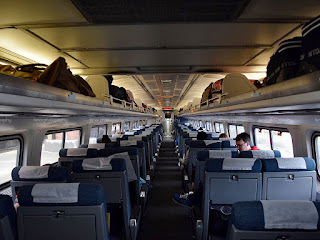 I had just left my seat to go to the cafe car then - but a lot of people were getting down here, and the aisles were crowded in the coach between our coach and the cafe car. I returned to my seat due to the crowd, and just then the conductor announced that we were very early, and would depart only at 0923hrs! He welcomed passengers to get off the train and have a stroll, and just requested all passengers to be back before 0920hrs. What more did I want? I got off the train and walked towards the locomotive. The platform was just long to hold 4 coaches, and was in the ground level. 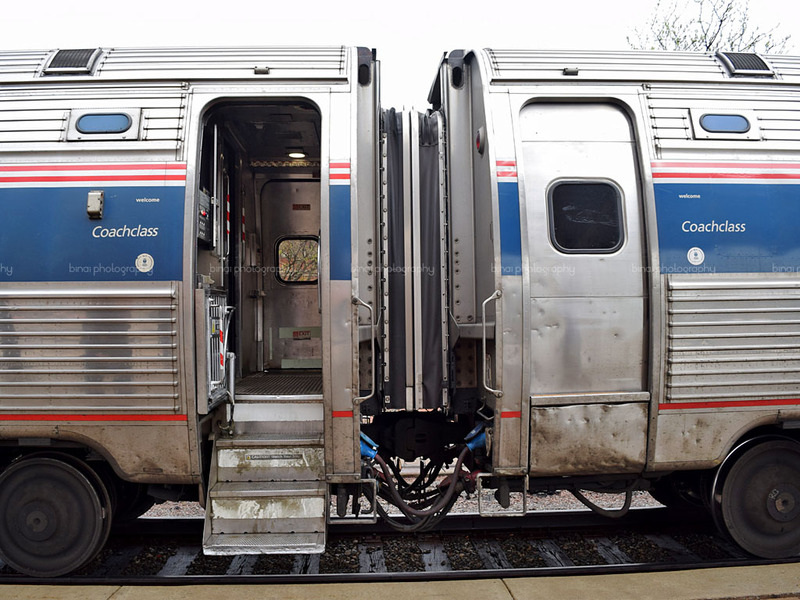 The doors of only two coaches were opened. The platform finished a coach length short of the locomotive. I got off the platform and walked on the ballast bed towards the locomotive. The blue and silver coloured GE Genesis P32AC-DM #715 was desperate to go. 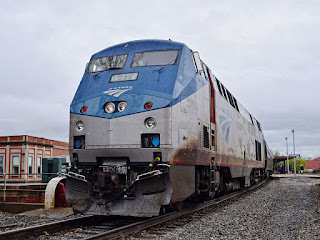 The locomotive was idling - it was huge, and much taller than the passenger coaches! The coaches looked puny compared to the locomotive! 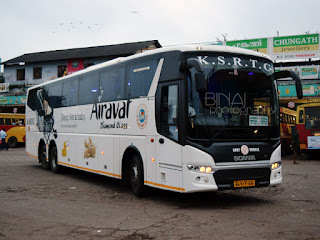 I had a close look at the coaches. My coach (#82613) was an Amfleet I type passenger car built by The Budd Company. I spent quite some time looking at the bogie (truck) assembly. The airconditioner seemed to be mounted below the coach. A little past 0920hrs, the conductor signalled all passengers who were on the platform to board the train. The train started off again at 0923hrs. The loco working my train, at Schnectady, NY. Schnectady, NY. 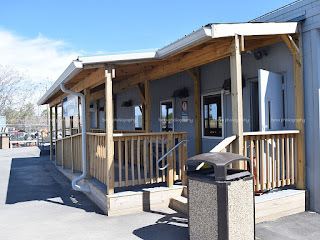 This station had a small ground level platform, and a coach length long shelter. 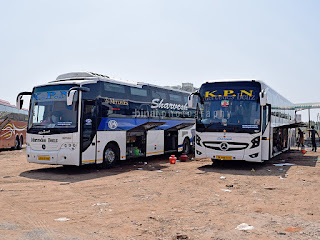 The coaches - one with the door open, and the other without. I tracked the speed of my train once in a while, and we were running around 115kmph most of the time. We reached Albany-Rensselaer station at 0944hrs. 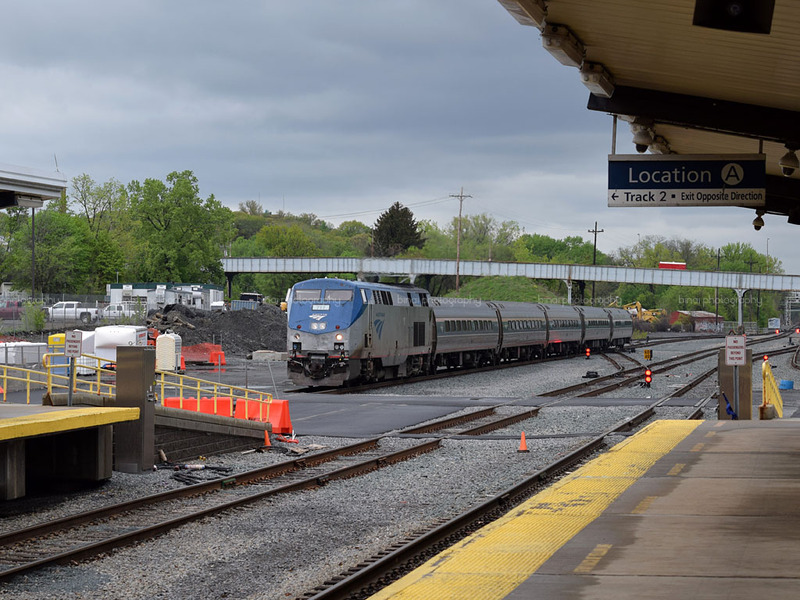 On the approach to the station, I noticed that the station had a major passenger coach maintenance yard, and quite a few GE Genesis locomotives were seen idling in the yard. Soon after we entered the platform, the conductor announced that we were before time at Albany as well, and we would depart only at 1005hrs. A lot of passengers got off here, so did the train crew as well. A new conductor, and engineers, joined the train here. Our coach got a little busy as well. While at Albany, I spotted the Toronto bound Maple Leaf Express pulling into the station - this train was also a 5-coach consist, and was powered by GE Genesis P32AC-DM #717. We started from Albany at 1005hrs. Maple Leaf Express entering Albany station. The loco is taller than the coach! This was my coach. Notice the signal which indicates whether the coach door is open or closed. I found two people occupying our seats as I returned to the coach - they refused to vacate the seat while asking me to prove I was sitting there earlier! A passenger traveling in a seat behind was quick to support - she pointed towards the "Seat Checked" cards placed above the seat. The duo hesitantly vacated the seats for us. Meanwhile, the train had picked some serious speed, and my phone GPS showed we were moving in the range of 150kmph! A little afterwards, I walked towards the cafe car to purchase something for breakfast. 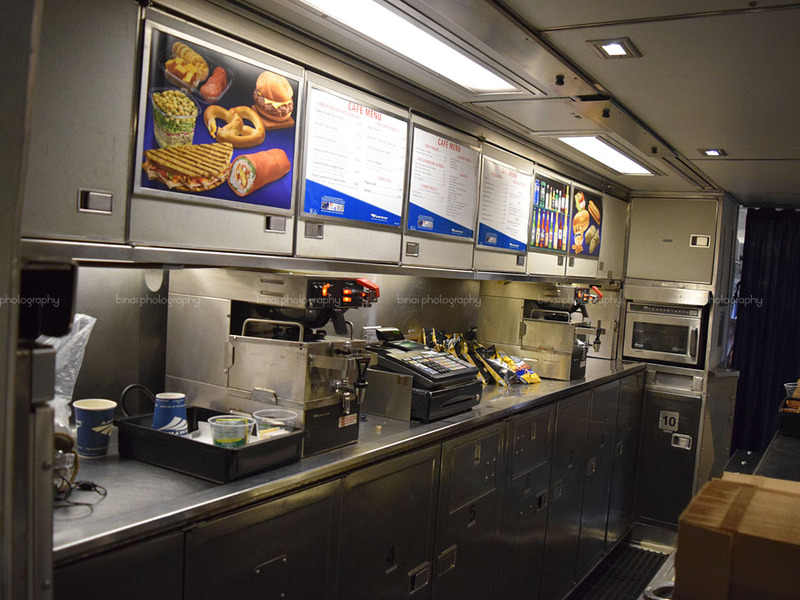 The cafe car, last in the consist, is divided into two parts. The rear half seats business class passengers in a 2+1 seating layout. 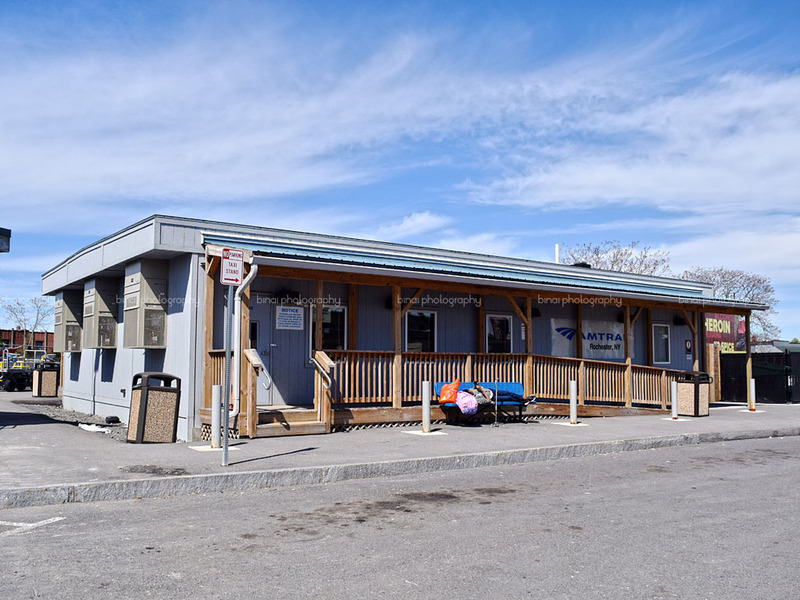 The "cafe" is located at the center portion - a small area with a microwave oven, coffee makers, and lots of storage space. An attendant at the cafe took my order - I wanted Bagel, which was not available. I picked up a Vegan Burger with Chipotle Pepita Sauce, a greek yoghurt and a coffee. The attendant helped me pick some sugar and half-and-half as well. They accepted a credit card for payment. 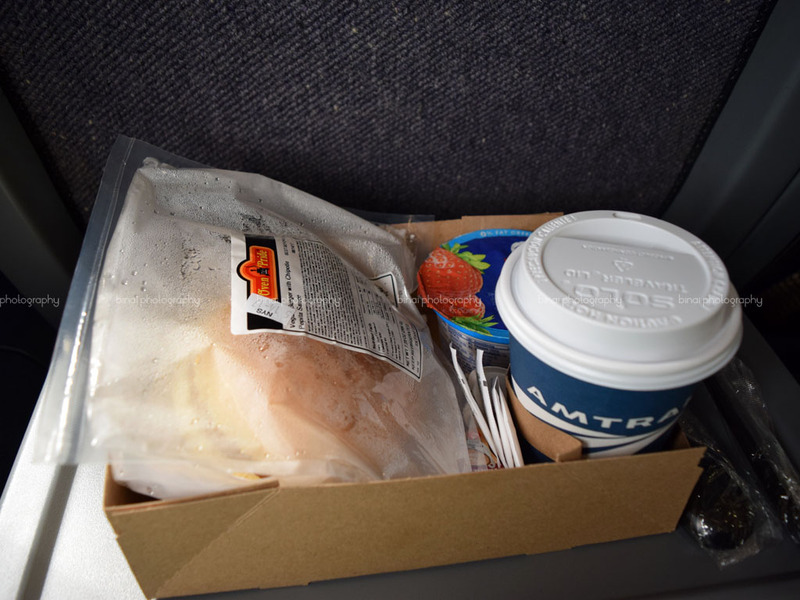 I had to return to my coach with my breakfast, since the seating area in the cafe car was packed. Galley in the Cafe Car.. 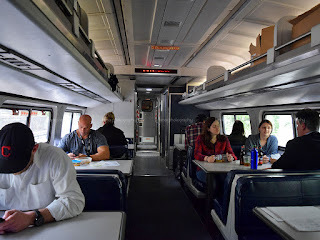 Seating area of the Cafe car..
We had to wait at a siding a little before Hudson station for a crossing - we crossed a five coach consist powered by a GE Genesis locomotive here as well. We got moving right after the crossing, and we pulled into Hudson station by 1036hrs. The coached filled here, and we got moving by 1039hrs. The ride after Hudson was "eventless" - we ran parallel to the Hudson river all the time, with some breathtaking views of the valleys around. We stopped at Rhinecliff at 1102hrs. 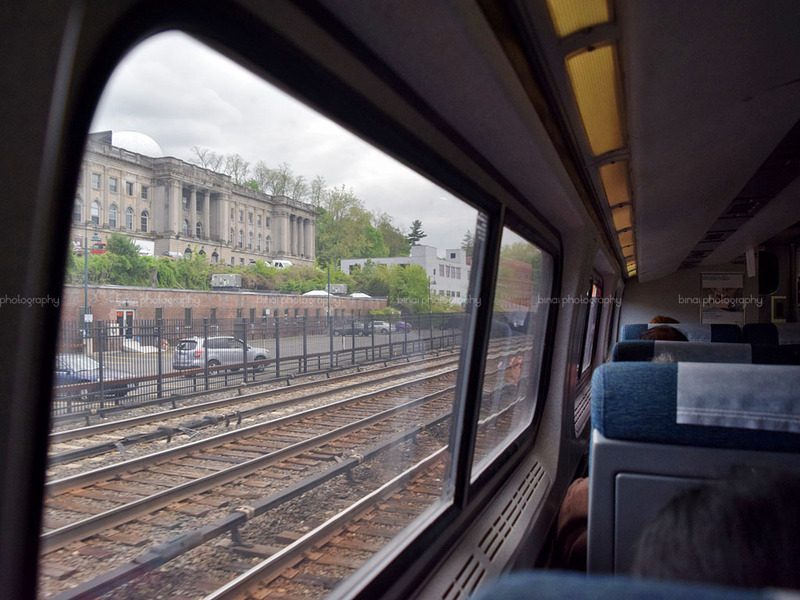 Our next stop was at Poughkeepsie (1115hrs) - the New York MTA Metro North railroad began here. This is a very unique line - they use an 8 coach consist with a GE Genesis P32AC-DM locomotive at one end, and a driving cab at the other end. We started from here at 1118hrs. The track was quadrupled from here on. The train contined at high speeds. The landscape quick changed from the rural settings that we saw till then, to a more semi-urban structure. We skipped past many station, and stopped at one - Croton Harmon. Electrified line (750v DC, fed through a third rail) began from here. 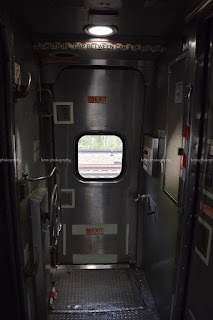 The passenger door from inside.. The seats. 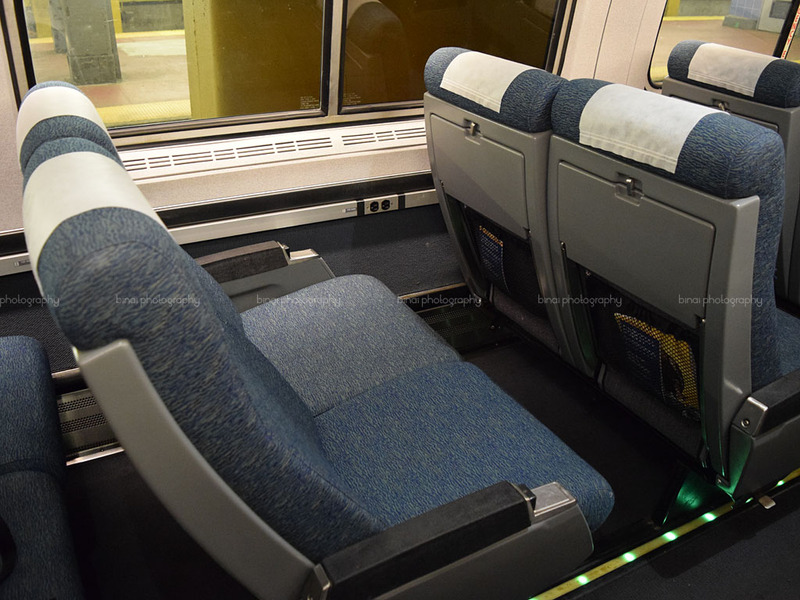 Note the leg room, charger points below the window. My coach after we got to New York Penn Station. Taller buildings, congested roads came into sight. We were running under a covered area now - appeared like a tunnel. We could see Hudson on and off. We entered a tunnel a little later - this tunnel leads to Manhattan. 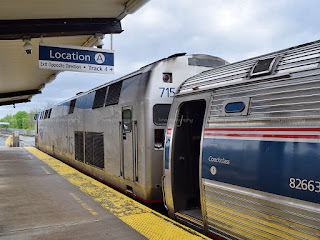 We had to hold for a while outside the station, and we finally entered New York Penn station at 1240hrs - five minutes before scheduled time. 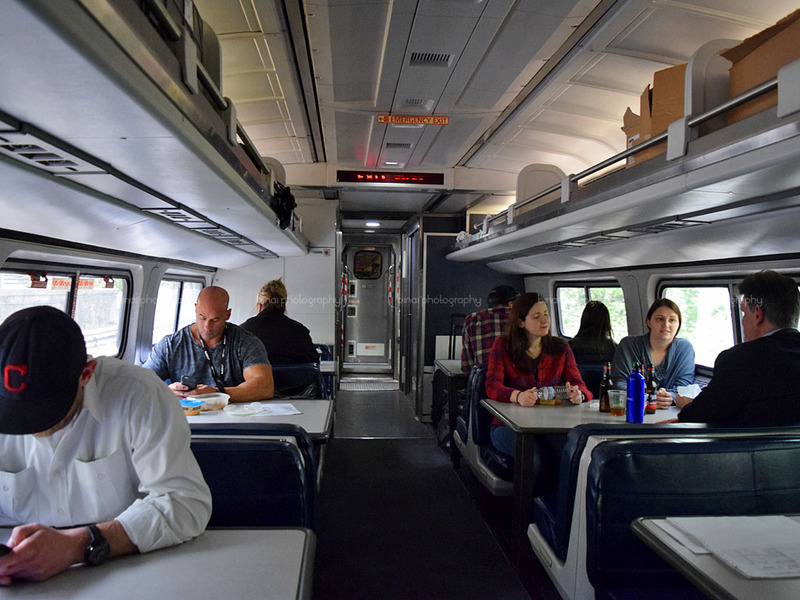 There ended my first journey on an Amtrak train, and I really loved it. The ride quality was amazing - silent, devoid of most jerks (except while changing tracks), but had a lot of vibrations. The seating comfort was great. The interiors resembled an aircraft, except for open overhead bins. The interior finish was great. The lighting used also resembled aircraft - diffused lighting for the aisle, and lights towards the window were used. Vents for heaters were located around the windows as well. The train was expensive compared to the bus, but was worth the money.